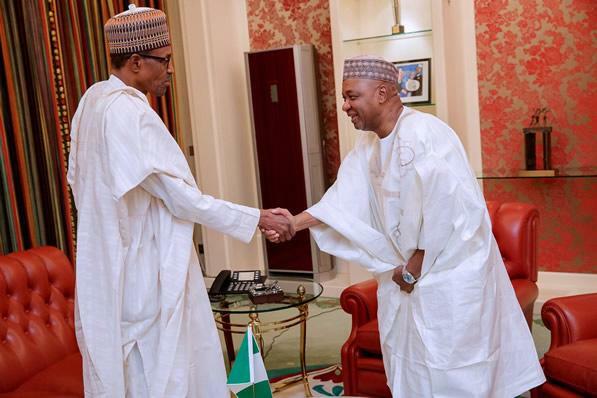 President Muhammadu Buhari on Tuesday met behind closed doors with former Vice-President Namadi Sambo at the Presidential Villa, Abuja. Sambo was vice-president to former President Goodluck Jonathan during the last administration. The meeting of the two leaders, which was held inside the President’s office, lasted about 25 minutes. The former vice-president arrived the Presidential Villa at about 12:00 noon and went straight into the President’s office. He left the premises at about 12.25pm. “It was a a private meeting,” Sambo simply told State House correspondents before stepping into his waiting car. He had, in 2017, visited Vice-President Yemi Osinbajo in his office; while he also joined Buhari for a Jumat service in commemoration of the nation’s independence last year. Speaking at the Seventh Presidential Quarterly Business Forum for Private Sector stakeholders on Monday, Osinbajo had said the difference between the present administration and that of Jonathan was that Buhari’s administration was not corrupt. He had said, “Today, with less revenue, we have increased capital funding by 400 percent as the minister has said, in power, works and housing, in defence, transportation, agriculture. “This is what distinguishes, in my own respectful view, this administration from the other. I can say that with what I have seen, if you have a President who is not corrupt, 50 percent of your financial problems are over. This is what I have seen, I can demonstrate it with facts and figures..."